Open ocean and nearshore coastal areas. 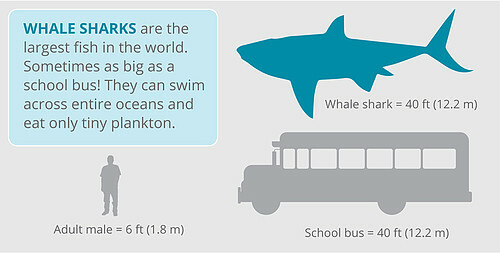 Whale sharks are the largest sharks in the world – truly the biggest ﬁsh in the sea! Like human ﬁngerprints, whale sharks have a unique pattern of spots that allow individual sharks to be identiﬁed. Whale sharks ﬁlter tiny plankton through their massive gills. The distribution of whale sharks points to the presence of plankton and serves as an indicator of overall ocean and ecosystem health. WWF has been working in collaboration with Mexican authorities and local organizations to address threats to Whale Sharks. 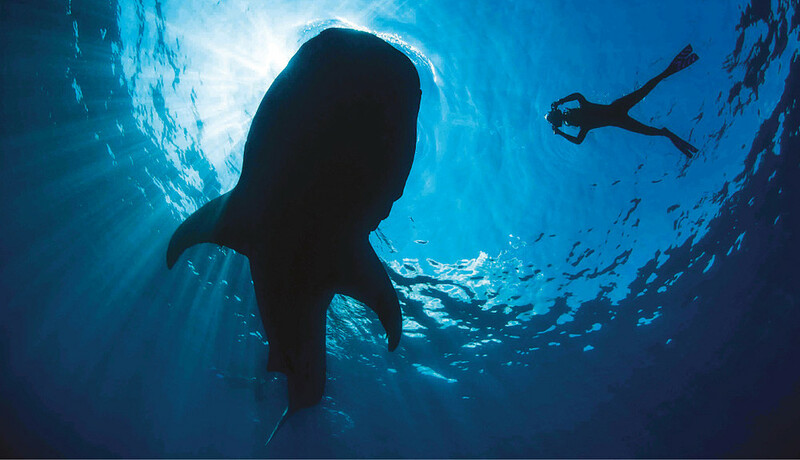 In a multi-pronged approach WWF combines science and research with awareness raising and public-private partnerships to improve best practices of tour operators and tourists, ensure good governance and enforcement of regulations and to monitor the whale shark population. Whale sharks are a delicacy in many parts of the world. People pay a very high price for the ﬁns, meat, and oil. International market demand is high and whale sharks continue to be targeted to meet this demand, especially in areas where the ﬁsheries lack regulations or enforcement. Poor ﬁshing practices threaten whale sharks when the capture methods unintentionally target the whale shark, an event referred to as bycatch, and injure or kill the animal. Marine debris, including cans, plastic bags and bottles, often ends up in oceans and other waterways, endangering whale sharks through the risk of entanglement or ingestion of this toxic and indigestible garbage. Coastal development has degraded the marine habitat that supports the health of whale shark populations. Increased tourism and boat traﬃc can also interrupt feeding habits and cause injuries to the sharks through collision with boats and their propellers, as well as swimmers and divers who approach whale sharks. Measurements over the last 45 years show that mean water temperature increasing, and this trend is expected to continue. As the water warms, it aﬀects species distribution, including larvae and plankton that whale sharks eats. Animals across the food chain will face the threat of shifting food cycles and movements. Although hard to predict precisely, the impact to whale sharks is likely to be signiﬁcant. Practice responsible whale shark tourism and never eat whale shark meat.